Have you heard about Drone Squad yet? Drone Squad is a social race management application that allows users to create race events for other pilots. Similarly, spectators can use it to see who is flying in upcoming heats, and who placed in each completed race. 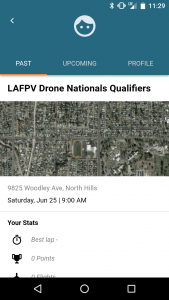 After seeing Drone Squad at LAFPV, both Choco and I were really impressed with the application and felt it needed a more detailed write-up on our site. We also reached out to the team at Drone Squad, who were nice enough to answer some questions that we had. So without further ado, lets talk about Drone Squad! So why does an app like this matter? I am sure some readers who have been in the hobby for years have the feeling of ‘if it ain’t broke, don’t fix it’ when it comes to race events. For years, clubs have successfully organized and completed race events without the need for fancy applications. Why would something like Drone Squad matter now? Oddly enough, the first race I ever went to was the IDRA LA event, which was held at the same location as LAFPV this year. It was interesting stepping back on the same field and seeing huge changes in such a short period of time. The pilots were faster, the crowd was larger, and there were a lot more people competing. One of my complaints about the original event back in 2015 was how unorganized everything was. IDRA was just getting on their feet at the time, and there really was no technology to assist with the race. Setup for heats was slow, there was a great deal of downtime, and most of the communication on standings was scribbled in a notepad or jotted into a smartphone. This is no fault to IDRA – they did amazing with what they had, and I assume that they didn’t expect the turnout of pilots that occurred. Similarly, they only had so many people to handle all the logistics of managing a race. Drone Squad fixes a lot of these problems. As the hobby grows, it will be important to have scalable solutions that keep events running smoothly. Most events we have been to in the past year have gone way longer than scheduled and have tremendous amounts of downtime. Seeing the heat lineups in Drone Squad makes for a smoother transition between races. 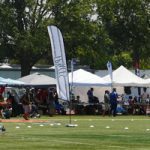 Instead of having to call the next batch of pilots and wait, Drone Squad notified users and had a section of the field setup as an ‘up next’ waiting area for the next heat. This allows the next heat to be setup and ready to go while the current race is ongoing – much more efficient. Moreover, this allows the race organizers to focus on other event details and helps prevent stretching the staff too thin. During every race I went to prior to LAFPV, the prior race standings would have been announced over a PA system. If you were out of audible range, or just missed what was said, you really had no way to see who placed in the previous race. Similarly, I found myself checking standings on Facebook pages the next day because it was just so unclear at the actual event. Drone Squad posts the results for each heat live in the feed window and allows for easy race recap. Event coordinators can also assign points and standings during the course of the event. This allows spectators to feel connected and follow the event progression much closer. The standby area for the next heat – a great way to minimize downtime between races! Outside of clubs and race organizations, it can be hard to meet other pilots. Drone Squad also allows small groups to create and promote events. It has helpful features such as allowing prospective racers to RSVP for upcoming events and display of past event attendance. It adds another social link into the community for individuals just starting out that may want to find or host races in their area easily. Prior event recaps and standings for pilots. 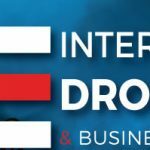 We were able to connect with Pete from Drone Squad and ask him a few questions about the app and its ongoing development. He was nice enough to answer all of our questions, as well as drop in an exclusive reveal for a future feature of Drone Squad! Check out the mini interview below. Items in bold are questions from the Propwashed team, and responses below these headers are from Pete at Drone Squad. Tell us about your team! 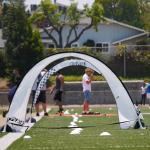 How did you get into quadcopters and drone racing? I built my first FPV quad back in 2012 and was instantly hooked. I love building stuff, writing software, messing with hardware, shooting video and I am a huge aviation buff. The hobby rolled all this into one. Perfect! Some people don’t understand what it takes to make great software. I have been making mobile apps for 10 years for companies like Warner Bros. and Microsoft but this time I wanted to do it for myself. So I built a world class team of engineers and designers here in Los Angeles to make my dream happen. This is the best team I have ever worked with – I hope it shows in the app. Tell us about Drone Squad. What does the app do? 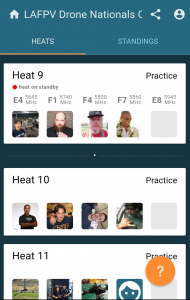 Drone Squad lets you connect with your local FPV pilots for fun and competition. You get to fly hassle free at races because we created awesome race management tools that makes running a professional event a breeze for organizers. It doesn’t matter if it’s 5 guys or 75, we have you covered. How can people use Drone Squad for their own events? Just download the app and register. I message everyone in the app so just tell me you are a meet-up organizer and we will give you all the help you need to run a successful race. Apps like Drone Squad can help improve the spectator experience, which is unfortunately lacking at many drone races right now. What else do you think can be done to improve the experience for spectators? We all know how hard it can be to follow a Drone Race. Our app shows you real-time heat and standings information so you can see who is flying, what channel they are on and more. 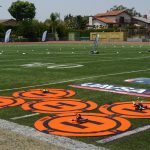 We recently powered the Los Angeles Drone Nationals Qualifier and spectators loved that feature! But there’s a lot more work to be done to make races more engaging. Live HD streaming video, telemetry overlays with detailed information about where everyone is on the course. Our goal is to bring NFL TV production values to any drone racer who wants to share their flight with the world. What is one lesson that you learned from LAFPV? We loved using the app at LAFPV, but one issue that we noticed was how much battery power it consumed. We assumed this was due to either the constant pushing of data / location information needed to update the user on the ongoing races. Is this a common issue, and if so, how does your team plan to address it? Honestly, that is the first time someone told us that the app consumed a lot of power. I suspect it’s because we are constantly getting real-time updates. But I have a few ideas on how we could address that. We see a ton of potential features for Drone Squad in the future, but were curious what your team is most excited about building into the app? Support for next generation timing systems. Ooops, I wasn’t supposed to say that publicly. Did I say that? Well you heard it here first. Drone Squad is currently free to use, but we understand that businesses need to make money. What are your plans for monetizing the app in the future? Yeah, we are a business! I can share some of our plans. We have built some race organizer tools that lots of people have found valuable. So we are going to figure out a model that works best for clubs, large event organizers, etc. And of course, there are lots of advertisers out that that want to reach our community so we are going to find some ways to help them without hurting the user experience. What events will your team be at in the near future? We will be at Drone Nationals so just look for the big orange Drone Squad tent – you can’t miss it! What can users do to help improve the app? Any features that you recommend users try out? We LOVE talking to pilots to learn from them and get honest feedback. When you download the app you will get an in-app message from yours truly so don’t be shy. But most important we need people to help to spread the word about Drone Squad. So please tell a friend to download our app. How can people best contact you or follow the development progress of Drone Squad? The best way to stay in touch is to download the app (I think I said that already). We release new features every week and it’s hard to keep track. But every couple of weeks we send a note out to users to let them know what we added. So there you go! If the next race you attend offers Drone Squad, give it a try. If your club doesn’t use a race management app, talk to your club leader and show them some of the features it offers. We think it is a step in the right direction towards making race events more efficient and spectator friendly. Thanks again to Pete for answering our questions – we wish his team the best of luck in their continued development on the app. 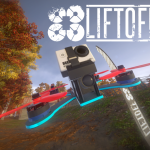 Have you had the chance to use Drone Squad yet? Let us know what you think about it in the comments below! You can find more about Drone Squad on their website – linked here!